NIFTY continued with its gaining streak and ended the ninth consecutive session in green as it ended on Tuesday with net gains of 20.35 points or 0.19%. Though the session ended with just modest gains, it saw a V-Shaped intraday recovery. 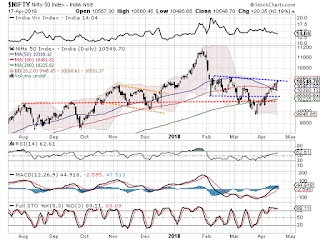 What was seen on Tuesday was a classical consolidation while the NIFTY still tested its important near term pattern resistance. As we approach Wednesday, as mentioned in our previous note, the zones of 10550-10575 will continue to pose immediate resistance to the Markets. Though the underlying buoyancy remains very much visible, the Markets are also set to continue to consolidate a bit more before a clear up move continues. The levels of 10575 and 10610 will act as immediate resistance area for the Markets while supports will come lower at 10510 and 10465 zones. The Relative Strength Index – RSI on the Daily Chart stands at 62.6075. While it remains bullish forming a fresh 14-period high it continues to remain neutral showing no divergences against the price. The Daily MACD stays bullish while trading above its signal line. A Hanging Man that emerged on Candles shows likely creation of reversal top and can temporarily halt the up move. Pattern analysis shows the NIFTY resisting to the 10550-10575 zones which is the strong pattern resistance are for the Markets. It is the upper range of the broad rectangle formation which was created since February. This range was breached but during the pullback, the NIFTY managed to crawl back inside it. Overall, there are no doubts that the undercurrent remains extremely bullish. The NIFTY is adding Open Interest with each up move this shows buoyant intent of the Market participants. However, given the overstretched nature of few oscillators and given the present structure of the Charts, some consolidation in form of range bound movements with limited downsides remains imminent. This will bring with itself fair amount of volatility as well. We reiterate our advice of protecting profits at higher levels while continuing to rotate stocks effectively while maintaining a cautious view on the Markets. Long positions were seen being built in POWERGRID, SOUTH BANK, ICICI BANK, BHARTI AIRTEL, NTPC, HINDALCO, L&TFH, TITAN, TATA GLOBAL, NCC, NATIONAL ALUMINUM, ITC and FEDERAL BANK.